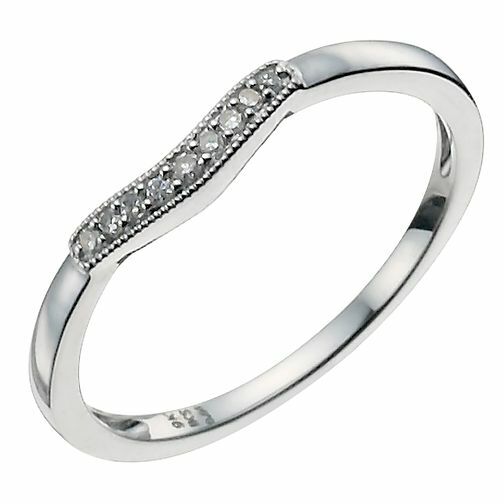 An elegant 9ct white gold ring detailed with a gently shaped, diamond-adorned tab with delicate milgrain edging. A stunning ring combining contemporary and vintage style to create a perfectly unique wedding band or dress ring. 9ct white gold shaped diamond ring is rated 5.0 out of 5 by 2. Rated 5 out of 5 by Anonymous from Beautiful A truly beautiful ring. Dainty and elegant and of a high quality. Rated 5 out of 5 by Anonymous from fits perfectly with my diamond engagement ring Shape is perfect. I wanted a slim ring and this one fitted the bill perfectly.